A broad movement of campaigners and organizations is calling on everybody to join action against excessive surveillance by governments and businesses. 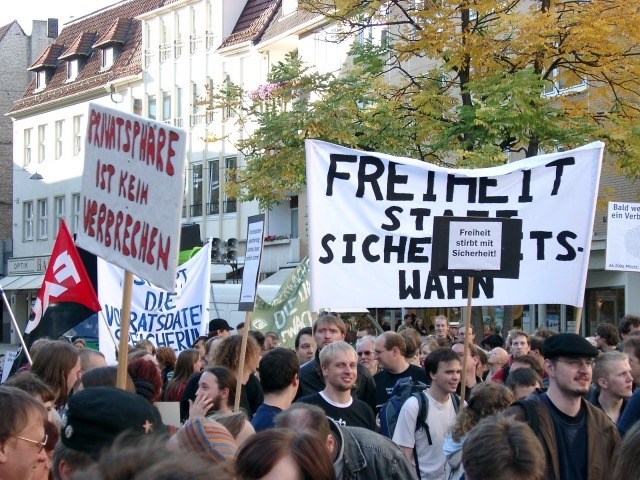 On 12 September 2009, concerned people in many countries will take to the streets, the motto being "Freedom not fear 2009 – Stop Surveillance Mania!". Surveillance mania is continuing to spread. Surveillance, particularly at the workplace, has been increasing. Employees are being watched and monitored in their work environment, sometimes even in their private lives. At the same time, governmental institutions do not miss any opportunity to register, monitor and observe us. No matter what we do, to whom we talk to, whom we call, which groups we are engaged in or what interests we pursue – "big brother" government and the "little brothers and sisters" in the business sector know it more and more thoroughly. The subsequent lack of privacy and confidentiality endangers our society. People who permanently feel that they are being watched and monitored are restrained from standing up for their rights and for an equal society in an unbiased and courageous manner. The purported security gain often put forward to justify measures of surveillance and control is more than questionable: Accumulating information on citizens does not enhance our protection against crime but costs us billions of euros every year. In that way targeted and sustained security measures fall by the wayside. This also applies to the search for remedies for more grinding social problems, such as unemployment and unequal opportunities in our countries. The manifold agenda of security sector reform leads to an increasing convergence of competences and co-operation among the police, secret services and the military, threatening to water down the division and balance of powers. As a result the constitutional limits to surveillance are being abolished leading our society to be increasingly walled off from the rest of the world. Surveillance as a part of everyday life is affecting not just minorities, but all of us: It compromises our religious freedom, our freedom of expression and information, the freedom of press, our freedom of association and the integrity of businesses. A large number of civil organizations and professionals are being exposed to special measures of surveillance and control, for example the personnel of counselling services, medical practitioners, members of trade unions, journalists and lawyers. The respect for our privacy is an important part of our human dignity, both at work and at home. A free and open society cannot exist without unconditionally private spaces and communications. In order to protest against security mania and excessive surveillance we will take to the streets in capital cities in many countries on 12 September 2009. We call on everybody to join our peaceful protest. Politicians are to see that we are willing to take to the streets for the protection of our liberties! You can find the latest information on the protest marches and the list of participating cities at our website: http://wiki.vorratsdatenspeicherung.de/Freedom_Not_Fear_2009. Following the homeland armament of the past few years we demand an immediate hold to new homeland security laws that further restrict civil liberties.